Our data center has detected an issue affecting the physical host on which our cloud system resides. Your virtual server may not be accessible. No action is required from your end at this time. We don’t have an ETA on when your virtual server will be brought back to its original state. Once data center administrators have completed the investigation, we will update this blog with how we plan to proceed from here. [Tue Apr 9 05:05:15 UTC 2019] updated: Everything is OK now and the service was broken for one hour this time. We will keep watching. If your SIP phones are out of services, please reboot them to take a try. If you still have problem, please update us. Thanks. Some customers report a crash problem to us. All of them deploy “SIP over TLS” in their VoIP networks. We have upgraded miniSIPServer to latest V35 (build 20190313) with following key modifications. (1) In the latest miniSIPServer, SSL library has been upgraded to the latest version. (2) Only TLSv1.2 method is kept, that means SSLv2, SSLv3, TLSv1 and TLSv1.1 are cut. When we did research on customers’ problems, we found some bad guys were trying to use the bug of SSLv3 to hack into MSS. We have to move all these methods out to defend that. In future, we will add other methods, such as TLSv1.3. At this time, we need confirm SIP phones can support TLSv1.2 too if we want to deploy SIP over TLS. In another way, we refine “SIP over TLS” document to provide a simple demo on how to create certificate files. Our data center have scheduled maintenance windows during which the basic infrastructure will be updated. During the maintenance window, all our Cloud-MSS nodes will be powered down and that means all virtual servers will stop working. While a two-hour window is allocated for the maintenance, the actual downtime should be much less. Previous miniSIPServer versions only limit “maximum concurrent outgoing calls”, and didn’t limit the total concurrent calls. Normally, it can fit most requirements since we think SIP phones or SIP clients should be able to limit their incoming calls. In recent days, some customers response that their SIP phones don’t have enough functions and hope miniSIPServer to be able to limit total concurrent calls of each SIP phone. To fit this requirement, we upgrade miniSIPServer to V34. Please refer to following figure. You can configure “maximum concurrent calls” to be zero. In this strange scenario, the SIP phone will never receive call and cannot make any outgoing call. It is to be noted that “maximum concurrent outgoing calls” should be smaller than “maximum concurrent calls” because “maximum concurrent calls” limits both outgoing calls and incoming calls together. miniSIPServer provides openAPI interfaces for customers who want to operate or manage miniSIPServer through their own systems. Previous openAPI was stored in GitBook and has few interfaces. Now we migrate it back to our official website. Please refer to following document. In this document, we provide many interfaces almost cover all necessary interfaces for basic calls, such as SIP trunk, external lines, routing, and so on. Hope it can be helpful for your solution. If you need us to provide more interfaces, please contact us. All suggestions are appreciated. Sometime, we may fail to make outgoing calls through SIP trunk if its service provider has some problem, such as no enough resources, and so on. If customers configure several SIP trunks and they are from different service providers, we can configure miniSIPServer to try another SIP trunk to continue outgoing calls. 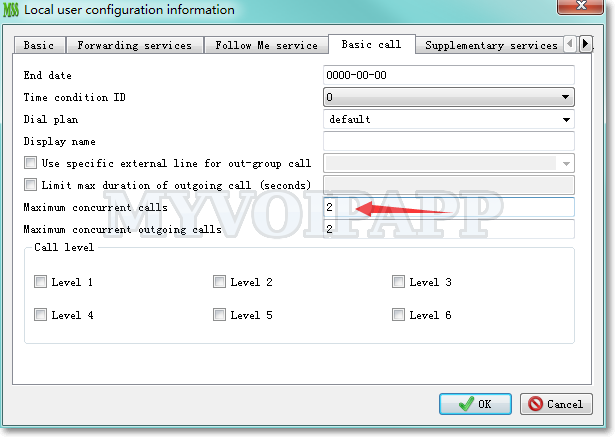 In the SIP trunk “outgoing call” configuration, please configure a chained SIP trunk described in below figure. Previous miniSIPServer has a trace tool which is “trace all”. It can capture and trace all SIP calls which MSS receives or sends out. This tool is very useful when we build the VoIP network at the first step. But it is almost useless in an exist working environment. It is dangerous to capture ALL SIP calls in a working system since there are too many SIP messages and inner information. By default, we can filter the call according to caller number or called number. In the recent V33 version, we disable “trace all” and replace it with “trace on IP address”. Please refer to following figure. With this tool, we can capture a specific complete IP address, such as “10.0.0.101”. We can also set a part of IP address to capture some SIP calls from some IP addresses, such as “10.0.0”, in this scenario, all SIP calls from IP addresses begin with “10.0.0” will be captured. By the way, we can also set IPv6 address with this tool. Now you can see this tool can be used in both lab environment and working environment. Finally, we release the latest LTS version V32. It has been a long time since we released the first V32 for test. During these months, we have updated web UI, GUI, SIP core and lots of items. This is a very exciting version and we will provide FIVE years tech support for it. In another way, the latest stable version is V33 now. From this version, Linux (X86-32) systems will not be supported. New features and services will be developed on this version. Hope you can enjoy these versions! We often configure miniSIPServer to connect VoIP carriers’ network with external lines. There are lots of VoIP carriers and someone always asks us how to configure external line. In our step by step document, we give a demo to configure MSS to work with “call centric”. You can refer to this document for more details about VoIP networks and external lines. In another way, we give some more examples in chapter “External lines” of F.A.Q document. Please refer to these documents if you are interesting in it and hope they can be helpful to you. We rebuilt miniSIPServer V32 for the latest Raspbian. That means only Raspbian (Stretch) will be supported now. If you are still running MSS on Jessie or older systems, please upgrade Pi before you prepare to upgrade MSS.